Welcome to the third episode in our series on Acuity's developer-friendly scheduling and booking platform. In prior episodes, we provided a general introduction to its calendar booking and appointment service and Acuity's embedding, developer API and integration services. Today, we'll continue coverage of Acuity's developer platform, moving on to its unique OAuth support, its notification webhooks, and its API-based reporting capabilities. Since this tutorial is focusing on its developer platform, I encourage you to sign up at Acuity and explore more on your own. Acuity Scheduling may be the most developer-friendly scheduling solution available. But it's also an extremely effective web service for all of your scheduling, booking, and calendar appointment making needs. 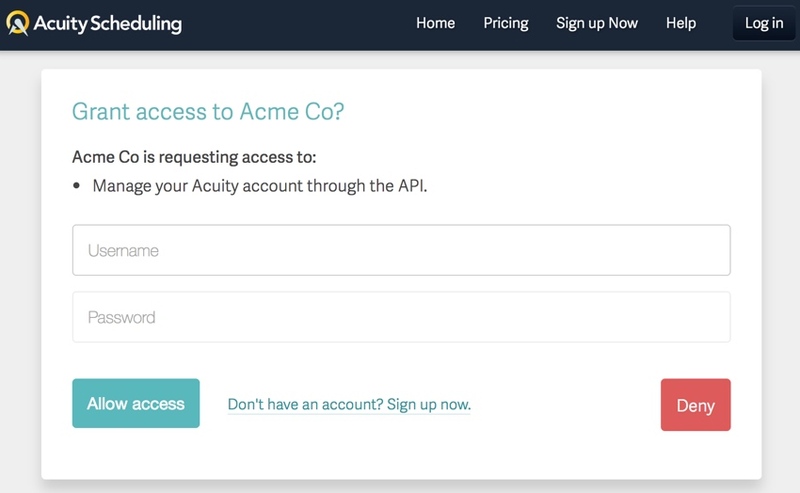 If you're extending your application to work with a number of Acuity accounts, let's say scheduling for a large company with many Acuity team member accounts, you can use Acuity OAuth integration so that each user can quickly and easily work with and manage their calendars and bookings. You're likely familiar with OAuth from signing in to an application using your Facebook or Google account. Acuity provides this same capability for its accounts (see featured image above). OAuth2 is a standard for applications to grant authorization and exchange credentials for an API securely. It's the best option for allowing users of your application to connect to Acuity. A user clicks a connect button in the client (your application) and is redirected to Acuity to enter their credentials. After authorizing your app, the user is redirected back to your application with an authorization code, which you'll exchange for an API access token. The callback URI is the URL where Acuity will deliver an OAuth authorization code for the requesting user. You'll then need to use that code and your API keys to request a permanent token to store in your database. The token will allow you to make scheduling and calendar API calls on behalf of that user. Once you've got a client account, you'll be ready to start integrating. The first step is to redirect the user to our authorization_url. It's usually a good idea to display a button like "Connect to Acuity." Then, store the ACCESS_TOKEN for your user to be used for ongoing API requests. For deeply integrated services, Acuity provides a near instant expansion of your platform and its capabilities, as well as an easy way to extend your team's use of Acuity into other services. As I've written before, if you can imagine it, Acuity's developer platform pretty much provides it already. 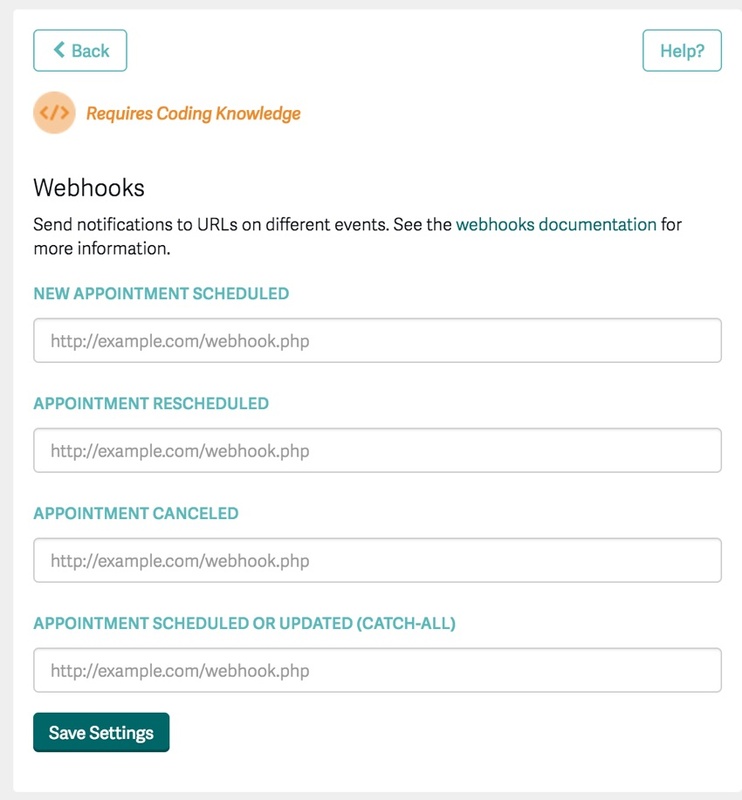 The Acuity API also provides webhooks to notify your application when an appointment is scheduled, canceled, or rescheduled. Under Acuity's Integrations menu, set the Webhook integration with the URL to be notified on changes to appointments (as shown above). The URL must be to port 443 or 80.
action: either scheduled, rescheduled, canceled, or changed, depending on the action that initiated the webhook call. id: the ID for the appointment, get the appointment details through the get appointment API call. calendarID: the ID of the calendar for the appointment. appointmentTypeID: the ID of the type of the appointment. scheduled is called once when an appointment is initially booked. rescheduled is called when the appointment is rescheduled to a new time. canceled is called whenever an appointment is canceled. changed is called when the appointment is changed in any way. This includes when it is initially scheduled, rescheduled, or canceled, as well as when appointment details such as email address or intake forms are updated. Webhook notifications are signed by Acuity using your API key, so you can verify that a notification is from Acuity. There's rich information and examples specifically for this in the API Documentation. 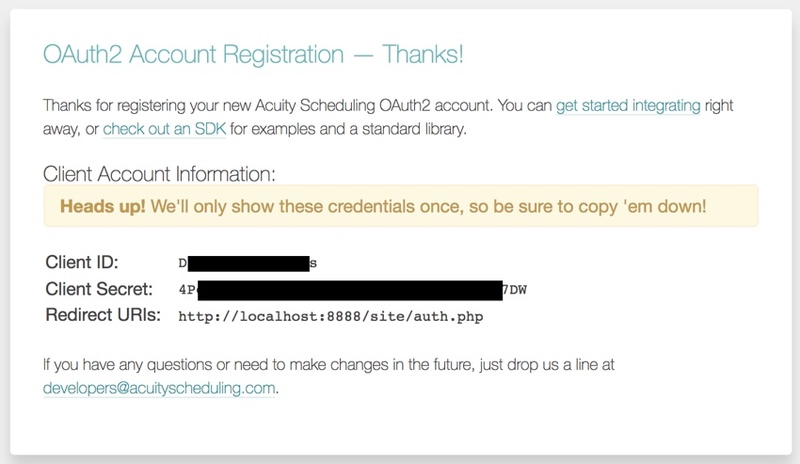 If you take a look at Acuity's API, you'll notice that you can now dynamically create subscriptions via webhooks. This feature is currently in testing but you can try out the feature right here. The more you integrate your application and service with Acuity's calendar and booking API, the more important it will be for you to track what's happening. That's where using the API for reporting can come in very useful. One obvious reporting requirement is to show appointments coming into the system for various team members from customers and clients. The API makes this straightforward. By default, canceled appointments are not returned. 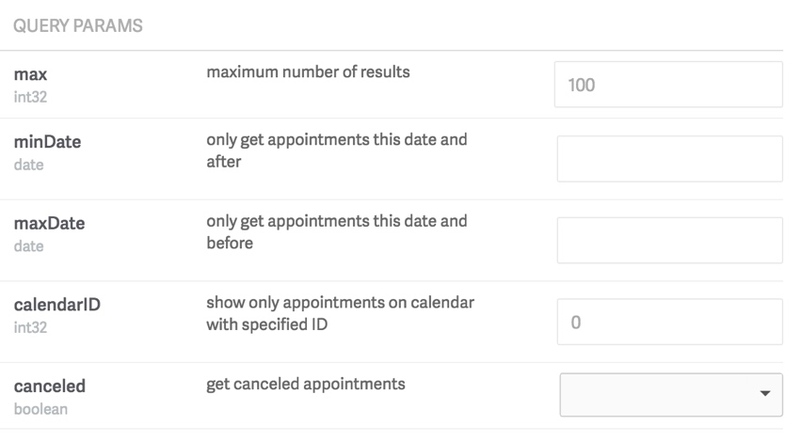 To retrieve canceled appointments, use the query ?canceled=true. Canceled appointment responses include a noShow field which is true if the admin has marked the appointment as a no-show, and false if the appointment is simply canceled. Since Acuity also allows you to list and sell products with its appointment booking services, /orders retrieves a list of orders from the online store with the most recent first. While not shown above, you can request status as delivered, paid, or unpaid and request product names using the title variable, as a semi-colon separated list of the product names ordered. "notes": "Some notes from the client"
Pretty simple... and yet all of what Acuity provides in its platform impresses me as in depth and advanced. 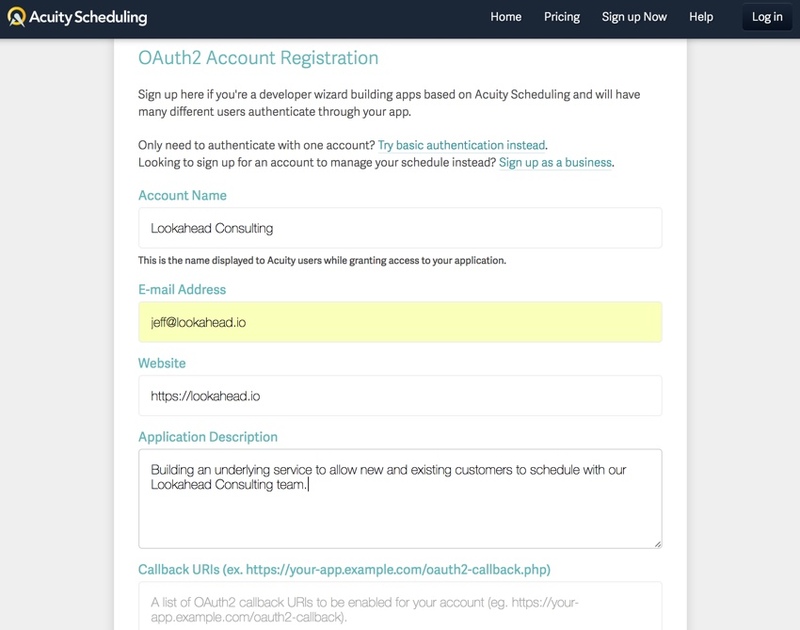 OAuth2: Allowing Acuity users via OAuth to work from with your application or service to manage their calendars and appointments. Webhooks: Using webhooks to channel notifications into your service or application when appointments are scheduled or changed. Reporting: Enumerating appointments and orders within your Acuity account network. I hope you've enjoyed the series to date. Please keep letting us know which areas you'd like to see covered in more detail in upcoming episodes. Post your ideas and questions in the comments below or reach me on Twitter @lookahead_io.